One of the most popular things wizards and witches are known for is flying. But, they couldn't just lift-off when they wanted to. They had to use an object or a tool that they can charm and make it fly in a controllable state. Meaning they can't charm a table and make it fly while they are sitting on him. So they have made an iconic witch tool that you can use to clean your room or that you can make it fly (disregard the first use). A Broomstick. 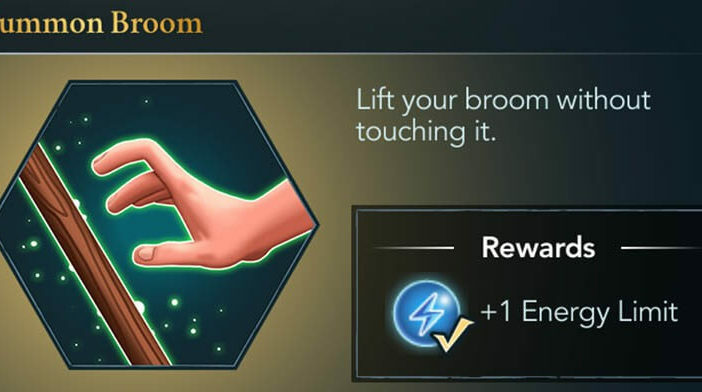 If you are wondering why of all things a broom, well they needed an object that is easy to carry and that Muggle's can't recognize them as flying vehicles. Later they also made brooms faster and much more comfortable to ride. They were also charmed in a way that if they are flying over Muggles world and if someone saw them by any case they would look to them like a shooting star. In Harry Potter: Hogwarts Mystery mobile game in order to fly you will have to pass some flying classes that are held by no other than Rolanda Hooch. You will attend your first class which is located outside the Hogwarts castle in the Training Grounds in year one chapter 3. There Madam Hooch will show you the first step you will need to learn in order to fly a broom. Even before you start to practice your broom control you will need to learn how to maintain it. There you will have to use some of your energy points in order to gain a star so you can proceed further to the next part of the lesson. For this concrete lesson, you will need to get 2 stars for a limited time of 3 hours which won't be a problem. Once you've gained your star you will be given the movement path on the screen which upon completing will make your character do the broom maintenance animation. When you have finally prepared and maintained your broom you will begin to practice broom summon by holding your hand above her and pronouncing "up", just like in the Harry Potter movie. This practice will also conjure your energy until you gain your second and your last star for this lesson. When you have finally finished everything you will be given a simple movement path which upon completing you will successfully make your broom lift from the ground and you will make her come to your hand. Upon completing your first flying lesson you will be granted +1 energy limit, meaning you can now store more energy in your energy bar while you are not playing the game. This will very much affect your future lessons and it will surely make them easier.